The mission of the BLIC Outreach Committee is to create, initiate, and coordinate community outreach programs in order to educate the public on BLIC mission and vision; and build partnerships with neighbors and neighboring organizations. This Committee is engaged in programs to reach out to our neighbors for better understanding, open dialogue, and lend assistance when and if needed. 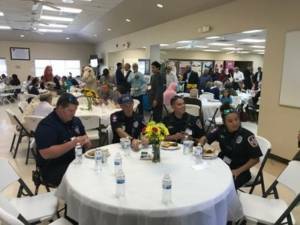 Some of the activities being implemented are open houses, interfaith dialogues, and food bank. You are curious to know what Muslims really believe in. It will be our pleasure to share information about the beliefs of the Muslims. You have got Questions about Islam and Muslims. We will be glad to answer your questions. You are interested in visiting the ISGH mosque(s). It would be our honor and pleasure to host you. You want to get a FREE copy of the English translation of the Quran holy book of Islam. You want your opinion to be heard. We will be more than happy to have civic dialog. You want to build Interfaith Relationship with our Center. It will be our honor to build everlasting Interfaith Relationships with your community.